My name is Lisa C. Aquino. I am a Catholic freelance children’s fiction writer/author. I write short stories for children ages 4-8 years old of Bible related events. I made up and use a fictional character, “Doty the Donkey” so that children can relate better to the stories that are written in the Bible. All my stories will rhyme because I feel that children will easily remember my stories more. My first book was published in October, 2017 and is now selling in Amazon and Barnes & Noble. 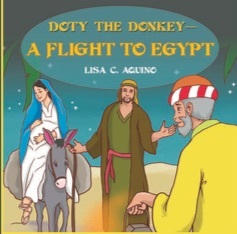 The book, “Doty the Donkey–A Flight to Egypt” will appeal to children as well as their parents on Doty’s perspective on his journey to Egypt. This re-telling rhyming Christmastime story will surely be a joy to read for the whole family. I plan on starting a series “Doty the Donkey” of having more books published every 1.5 to 2 years. My goal is to have every child know more about what is in the Bible and our Lord. If you need to get a hold me or have a question, I would love to hear from you. My email is dotythedonkey@gmail.com. Take care and many blessings with the greatest love!!! If you like to order my book, please go to http://www.dotythedonkey.com, Amazon and/or Barnes & Noble. Thank you.